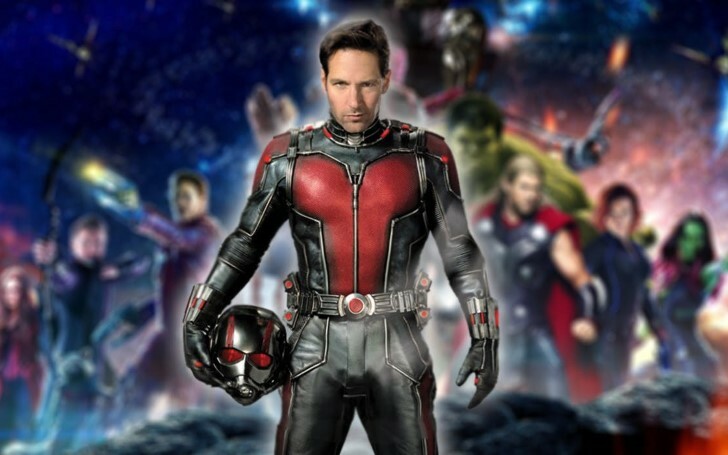 home Movies & TV Shows What Role Will Ant-Man Play in Avengers: Endgame? Here's Everything We Know So Far! There's much more to the established theory of Ant-man actually being a focal point in rewinding the Avengers: Infinity War. With the snap of his fingers, the ever feared mad titan, Thanos dramatically altered the Marvel Cinematic Universe, leaving the future of many popular characters in doubt and bringing the 2018 film to a close with one of the greatest cliffhangers of all time. In doing so, he also made Avengers: Endgame one of the most-awaited movies to date in the MCU. On top of that, the latest update-offering the very first footage from the movie and the film’s new release date has pushed the already over-the-edge fans beyond thrilled. Given Russo Brothers doing everything in their power to confine the rest of the details from the Endgame till the very date, April 26, 2019, the so-called movie pundits aren't able to help themselves from coming up with the arrays of their own theories. Some are headstrong with the concept of Time Travel to be inevitable but with Thanos himself destroying the gauntlet along with the time stone in it, the only-way-out now biases more towards the Marvel’s last card up their sleeves - Antman. How ironic it sounds in the first place!! Paul Rudd starrer 2015's Ant-Man is the Marvel Cinematic Universe's tiniest hero, but it seems now he's about to be the biggest key in the expected to be mega-blockbuster, Avengers: Endgame. Marvel Studios is preparing to tell the conclusion of its phase 3 arc that started with 2016’s Civil War. Ever since Thanos smiled at the end of The Avengers (2012), the series ultimate fate was nothing but the eventual confrontation between the notorious Titan and the Avengers. As Avengers: Infinity War showed, it turned out to be a costly showdown for the heroes, with Thanos snapping half of the universe's life into dust. The first trailer for Endgame showed how the heroes who survived the Decimation are coping with the losses, and it doesn't look great. Iron Man (Robert Downey Jr.) is close to dying in space, whilst down on earth, Captain America (Chris Evans) is still in despair with all those tear-shedding and not a single way out for the redeemed. The only moment of hope and levity comes when somewhat considered an underdog hero, Scott Lang appears at the very end of the trailer. However, this is the only footage shown of Ant-Man's role in Endgame so far. With the countdown already begun for the Endgame to hit the theatres and the limited amount of heads up officially released prior to the worldwide release, Marvel is successfully keeping the spoilers under wraps. Add to that, Ant-Man's role, in particular, is currently being more guarded, but that doesn't mean there aren't several hints of how he'll factor in the payoff. Here's everything we know about Lang’s role in Avengers: Endgame so far. Audiences first met with Marvel’s Goliath on-screen through 2015's Ant-Man predominantly played by Paul Rudd. Although Rudd’s character in the film, Scott Lang was an unlikely choice, Hank Pym (Michael Douglas) - the original Ant-Man – eventually picked him to take over the mantle moving forward. Lang only briefly encountered with some Avengers in Captain America: Civil War and wasn’t even in the credits in Infinity War, let alone the plot. The reason; the result of him being on house arrest for acting against the Sokovia Accords, which limited his heroic story only within Ant-Man and the Wasp. But, as the trailer for Endgame showed, it now looks like Ant-Man was instead being saved for a much larger part to play in the equation. While Scott may still be a bit puzzled and bit awestruck by his new teammates, but Ant-Man becoming a proper Avenger is now quite significant. Not to mention, Ant-Man is one of the founding members of the Avengers in Marvel Comics (though it was Hank Pym as the lead alias on the page while Scott Lang for the MCU), this is still a crossover comic fans have been waiting for. Ant-Man might also get the opportunity to work with Iron Man, Thor, and Hulk much like in Avengers #1 from 1963 and would be a major hand in attempting to save the universe in the process. 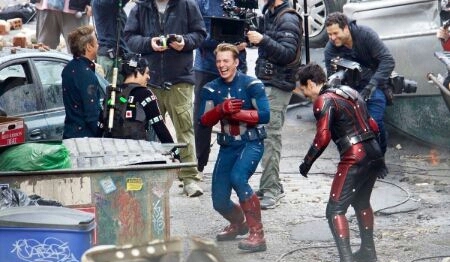 There's also been set photos of Scott meeting up with Captain America and Black Widow, further giving away the piece - how he'll work his way into the team. What makes Ant-Man's addition to the team Avengers all the more important is the ambiguos state audiences last saw him in. During Ant-Man and the Wasp's mid-credits scene, Scott Lang jumps once again in the Quantum world to harvest quantum energy for Ghost (Hannah John-Kamen) to help her remain stable and successfully does so, too. But, as he requests to be pulled back out of the Quanutm Realm, he does not get a response and the audience sees that Hank, Janet van Dyne (Michelle Pfeiffer), and Hope van Dyne (Evangeline Lilly) have all been disintegrated. This in turn left Scott trapped inside the Quantum Realm, but the last month’s trailer for Avengers: Endgame confirmed that he is going to make his way out. Consequently, this has become a major talking point among fans as there appear to be several options for how he could escape. In the first film, Ant-Man managed to escape the Quantum Vortex by using a Pym Particles Disk, and it’s possible he could try the same approach this time, too, but it has also been theorized that it could be the result of a fail safe of the Quantum Tunnel that Hank programmed. There's another even more popular notion - the upcoming newest team member, Captain Marvel goes all along to find him in there and rescues him. However, the triumphing theory still sticks to the explanation, that he will escape through time vortexes that are in the Quantum Dimension. And, as their name implies, this avenue of escape is more likely to have even bigger help on Endgame's plot. 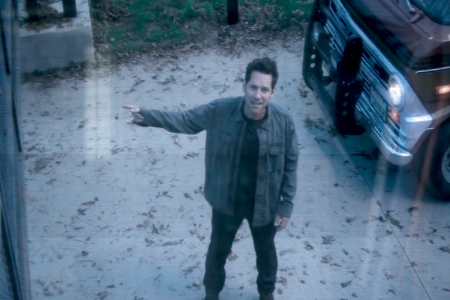 Ant-Man's coming into the sight in the final scene of Avengers: Endgame's trailer shows Scott standing outside the front gate of Avengers HQ along with looks-like-to-be Quantum Tunnel and then asking to let him buzz in. Captain Rogers is then seen noticeably confused by this and mutters if it is an old message or something else. While experts of easter eggs on the other hand, have already noticed that this video is not live and instead is labeled as somewhat archive footage. This is one of many hints in the trailer that is rather dividing some fans towards time travel in actuality being a major part of Endgame's plot. Still, Lang being stuck in the Quantum Realm and the not-so-subtle mention of time vortexes in the mid-credits of Ant-Man and the Wasp's appear to have completely set up the story of how the Avengers will try to salvage the universe in Endgame. The bright side of Lang actually stuck in the Quantum Realm is the fact that he has an edge of travelling through time back and forth. Being said that, this will make Ant-Man even more of a key character of all, not only because of his prior knowledge and experience with the sub-atomic world, but also because it looks as if he has likely already traveled through time to leave this message seen in the trailer. Although that is the only scene we've had of him in Endgame, we still have a theory that otherwise explains Lang has actually more part to play than Marvel wants you to believe, given the fact that he's just slightly off camera or maybe even digitally backgrounded from the scenes. Evidence of Ant-Man's significance to Endgame was leaking during the filming of the movie too. He was famously spotted on a set recreating the Battle of New York from The Avengers alongside a bit-looking older Tony, Captain, and even Doc Green himself in the picture. What’s so unusual about this: Ant-Man was not originally part of this fight. 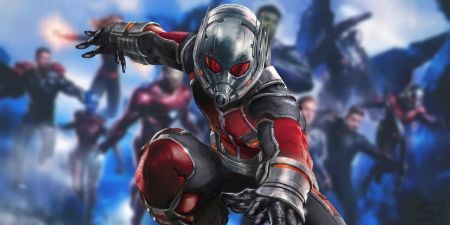 Still, through a combination of these leaks and ones from that toys’ incident, it would appear that Ant-Man at least peeps in to explain to the Avengers that they have the ability to travel through time thanks to the Quantum Realm. AN OLDER CASSIE LANG; DAUGHTER OF SCOTT LANG IS IN AVENGERS: ENDGAME!! Scott's story in Avengers: Endgame won't just wander around reviving those that he's lost, but also with those still around, as furthermore, an older version of his daughter Cassie Lang is also rumored to appear. And this alleged happening-to-be appearance of big Cassie (Emma Fuhrmann) could also be the result of Endgame's time travel if they happen to go through the future, but it also more likely shifts to the possibility of a time jump actually taking place. However, there were no any signs of a time jump of this version in the first trailer, but that may just mean such a big leap doesn't happen right away. Kevin Feige on the other hand said it was "somewhat accurate" that the marketing wouldn't show footage past the first 20 minutes, which could pretty much leave the option for the movie to jump forward in time and then feature the new Cassie Lang. And even if that supposition somehow doesn’t happen at all, the older Cassie still appears in the Marvel verse through comics and issues. In fact, Cassie is also one of the main alliase for the still-in-comics female hero, Ant-girl. We have even got this outlet in Ant-man and wasp with Cassie expressing the interest of going on to become a size-changing hero of her own, who in pages has gone by Ant-Girl, Stature, Stinger, and more. Although this obviously seems an ambitious project for Avengers' future phase for Next Generation heroes, but it still doesn't get with the picture of how an unusual side character's transition is going to impact a whole different movie. But of course, everybody is free to make their own forecast. While the wait is still on, all of this information creates a solid base that Ant-Man suiting up once again with this time the mission ought to be quite big. But how much of an aid he's going to be for the Team Cap in defeating the death-worshipping giant is a matter completely upto the course of time.